(Text automatically translated) stone cottage and large wood fireplace, tastefully decorated, large terrace of 30m2 with magnificent mountain view, quiet, comfortable. Improved to the cottage after tenants observations. Medieval village with charming Provencal market twice a week, tennis, basketball and heated in village.Golf in Digne, canyoning, rafting Barcelonnette Castellane swimming pool, full water based air , Hiking (with possible guides) beautiful, varied levels. "Superb location. 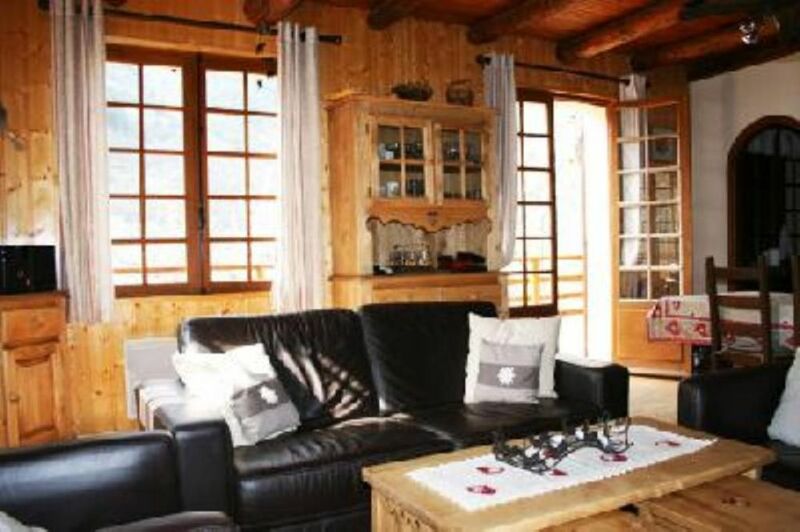 Chalet was very cosy, with fantastic large terrace which we used for all our meals. We were two couples and two children. Two bedrooms had a full size bed and two twin bunks, the other had a double bed but it was small and not really large enough for two adults. So we opted to share a room with our children who were in the bunk beds. We didn''t realize that no linens were proivded but the owners were very flexible and let us go into the attic and use some of their items. THe lcoation was fanstastic. We enjoyed hiking at Lac D''Allos, cable cars at the ski resort and the scenic Gorges du Verdon. The village of Colmars-les-Alpes was very picturesque and buzzing with activities (market, evening traditional show, playground, museum, restaurants, outdoor swimming pool, tennis courts etc.). Great bread at the award-winning boulangerie, great meat at the boucherie. Our only regret was that we couldn''t stay longer. Would recommend for those looking for a mountain retreat with a certain convenience factor." Bonjour, nous avons passé un séjour plaisant dans ce chalet, boiseries, feu de cheminée, vue sur une montagne splendide, à distance parfaite à pied du village, comme en voiture des stations de ski. Trés bel endroit pour passer des vacances en famille ,chaleureux et bien agencé....à recommander sans restriction... ! Urige Hütte mit allem Notwendigen für den Urlaub, auch mit mehreren Personen. Das Badezimmer könnte für 5 Personen etwas größer sein und ein Grill auf dem herrlichen Balkon hätte das Erlebnis perfektioniert. Dann währe es 5 Sterne wert. Chalet fonctionnel. Au calme mais à deux pas des commerces. Nous avons adoré la grande terrasse surplombant le village. Mooi ruim Chalet, rustig gelegen, in een mooie omgeving met mooi uitzicht. Op 15 minuten lopen (wel steile weg) vanaf Colmars les Alpes, klein niet toeristisch middeleeuws stadje. In de middag zon op het ruime terras. ‘S-ochtends geen zon, huis in de schaduw van bomen en bergen.